Tell us about what you do – your mothering situation and your work outside of that. I am Ella, a mum of two little girls who are 5 and 3 and live in Leigh on sea. I am a self obsessed makeup junkie and will always be seen wearing a bright pink lipstick even on a cold wintery morning school run! What makes me tick? Laughter, love, happiness, crystals, learning, spending time with loved ones, singing and dancing! I am also the proud owner of The Reiki Room in Leigh on sea, specialising in Reiki, Rahanni and Indian Head Massage. I work around my children and just love meeting new people and being able to help them during different phases of their life. Life can be challenging and it’s very hard to feel balanced in the world that we all live in. The therapies that I practise help align and balance the body’s chakras to enable my clients to relax and release all that they need. I am now into my third year of energy work and find that the energy is different in each of my treatments and with each client which is something that I just love!! I am extremely passionate about the work that I do and find it both exciting and rewarding! As well as The Reiki Room and seeing clients on a 1:1 basis my good friend and colleague Gemma Bennett and I run Soulful Hearts where we run modern day wellbeing workshops and evening events for women! We believe in authenticity and have created a safe space for women to come and join us. 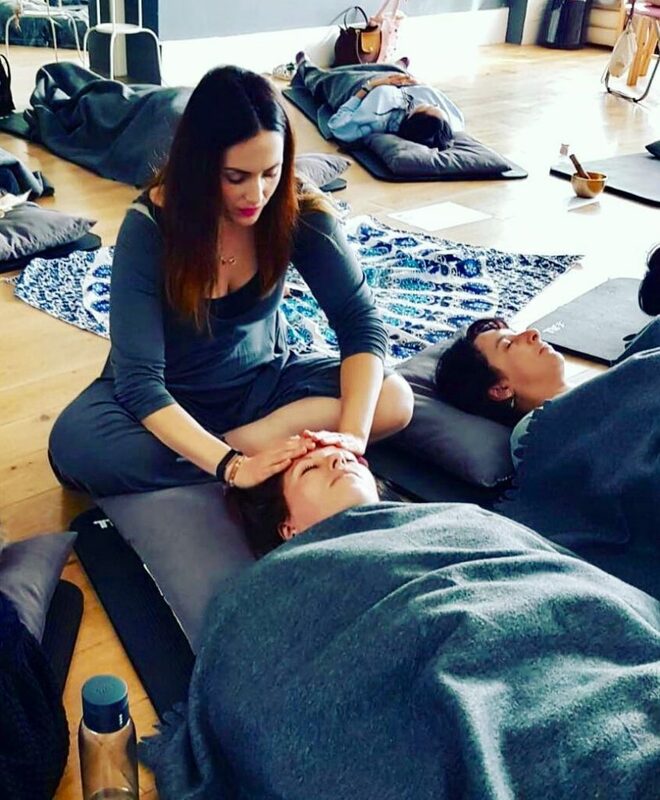 Whether it be for an evening focused around Release and Re-energise using mediation and sound vibration or a day workshop “Awakening the Soul” to focus on who you really are and embracing every part about you! Before I had my girls I use to be an events organiser for Lloyds Banking Group Head office, running internal events for the CEO and board of Directors. I absolutely lived and breathed events. I loved the fast pace and level of detail. Seeing an event unfold into a success before my eyes and in some cases achieving the unachieveable for me was such a buzz! How did you get into your current work? I went back to London after having my first daughter but decided to take a break from events when I was pregnant with my youngest. However, at six months pregnant my then 22 month old had an anaphylactic shock so in my heart and head the fast pace life of London was no longer for me. Due to her reaction I got anxiety and was consumed by fear! 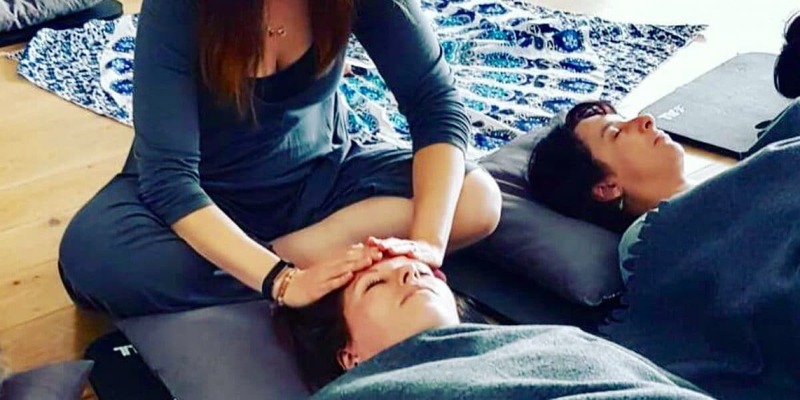 I found Reiki to help with the anxiety and I loved it so much that I wanted to learn Reiki for my friends and family. From then my passion for Reiki has grown and flourished! I am driven by being able to help people and to be able to connect with people on a soul level and offer support. Seeing things I have learnt and practised being incorporated into my children’s daily life and knowing the choices I have made are for the better is all I need to keep me going! What is your biggest challenge in making it work? My biggest challenge is finding time to keep learning and reading! I am now in a world that couldn’t be further to how I was brought up and different from a life I once envisaged. However, I just love everything about it and take comfort in knowing that everything I do comes from good intentions and from my heart. Apart from my two girls I am proud of The Reiki Room and what I have achieved! When I started out The Reiki Room was just an idea but I went ahead with this idea and done it anyway even when people doubted my choices. I always believe It’s better to regret something you have done than something you haven’t! My future plans are to evolve and grow with my business and keep learning as I do. I will be in a position to see more clients once my youngest is at school and would also like to take Soulful Hearts into the corporate world and eventually run retreats!! Self care -what do you do to fill your cup? To nourish myself I indulge in things I love! I take time out and draw upon different things depending on how I feel! I can go from one weekend of mediation and gong baths to the next weekend going out dancing to garage and drinking vodka! I also sing in a theatre company in Hornchurch with all funds going to The Lennox Children’s Cancer Fund and just love the buzz and the connection!! This year I will also be running two Tough Mudder’s to raise funds for the anaphylaxis campaign and the Amy May Trust! Basically my diary is always full but I wouldn’t want it any other way, for me to relax is to be busy with things I love, things that feed my soul so I can remain true to who I am. My tip for a new mum apart from always sit and enjoy a cuddle is SWEETS!! Some days its survival of the fittest and sweets always help any situation!